Neroli Hydrosol (Orange Blossom Water) Citrus aurantium, Organic grown, not certified. from Tunisia This imported, organic hydrosol, distilled from the blossoms of the Bitter Orange tree, smells the way orange blossoms should, mild and sweet enough to drink. I have been using it as a cologne to echo my Reunité blend (which I often wear as perfume.) I spray it in the room when any of us are feeling anxious or stressed. Instant release. Some of my friends have talked about making a sorbet of a blend of the rose and Neroli hydrosols. (Perhaps we need to contact Ben and Jerry's?). A spritz or two in a glass of spring water is soothing and emotionally settling. Wonderful stuff! (I like a drop added to a cup of black sweet coffee, and always thought it was weird, until I recently read that Neroli can help calm "coffee jitters", not that I'm ever jittery, of course!) A client mentioned that she uses a spritz of Neroli Hydrosol to calm her cat when it needs a trip to the vet. My daughter the groomer took this idea and ran with it; she uses the Neroli Hydrosol to calm nervous animals before bathing/grooming them. Says it works like a charm! Another friend reports using Neroli Hydrosol as a body spray during her daughter's labor and delivery. The new mother stayed cool and calm, the Neroli helped immensely. This same friend reports that using as a toner, on a regular basis, seems to be helping with thread veins (couperose). Shirley Price recommends Neroli water for people suffering from Seasonal Affective Disorder or to relieve stress or emotional upsets. No end to the uses of this sweetly scented floral water. We've used it on long flights, if one of our number is afraid to fly. A gentle spritz calms the anxiety. Neroli hydrosol is mildly astringent and may be the hydrosol of choice for oily skin. If it is your choice, try blending it with rose, chamomile or geranium. It is superb for oily or acnied skin. (But I love it for my mature skin, as well.) Anita Ink recently wrote: "I have combination skin, and have found the neroli hydrosol to be a good toner and balancer for both the oily and drier areas. In the dry areas it smooths and polishes my skin without excessive tightening, and I follow that with a light moisturizer. In the oily areas I use several spritzes of neroli and rub it in well. It really tightens the pores and gently clears any oily debris that might be lurking under the surface. Makes skin care ultra easy...and fun!" One friend uses either a spray of Neroli Hydrosol or a dampened cloth to wipe her toddler's face to ease him out of a temper tantrum. Price recommends its use for over-excited babies, since it is calming without causing sleepiness. 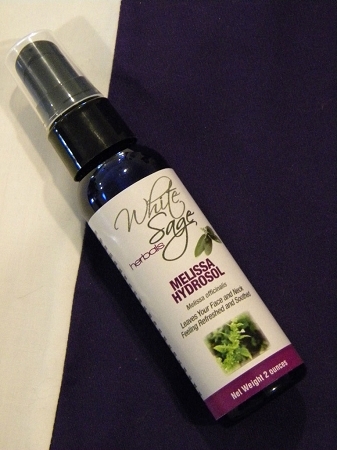 Our hydrosols are packaged in a 4oz cobalt blue bottle, with an atomizer spray top or in a 1 oz. "trial size". Please remember to store your precious hydrosols under refrigeration. True, natural hydrosol contain no preservatives so should be treated as perishable. We store them under refrigeration, and do our best to maintain sterility while rebottling, however if you plan on using any of these healing waters internally, we suggest you pasteurize them before use. Filtering through a fine filter (a coffee filter works beautifully) and slowly heating just to a very slow boil should insure sterility without damaging the healing elements.